Unlike its predecessors, the art quilt is intended for display on the wall rather than the bed. Among the many recent additions to the BMA’s late 20th-century textile collection are five stunning quilts created by professional artists who chose to express themselves with cloth and thread, in some cases abandoning their original media in order to do so. These intricate art quilts include examples of works by the foremost proponent of the art quilt, Michael James, whose stunning Metamorphosis (1983) plays with color transitions and the transformation of space. Pamela Studstill’s elaborately pieced and painted quilt, #76 (1988), is accompanied by the original commission drawing and fabric swatches. Quilts by Baltimore-based artists Elizabeth Scott and Adrien Rothschild link the art quilt to this city. Scott’s esoterically appliquéd and stitched Plantation (1980) gives an abstract depiction of both the night sky and the furrowed earth as remembered from her childhood in South Carolina. Rothschild—influenced by the paintings of her mother, Amalie Rothschild, and the work of M.C. 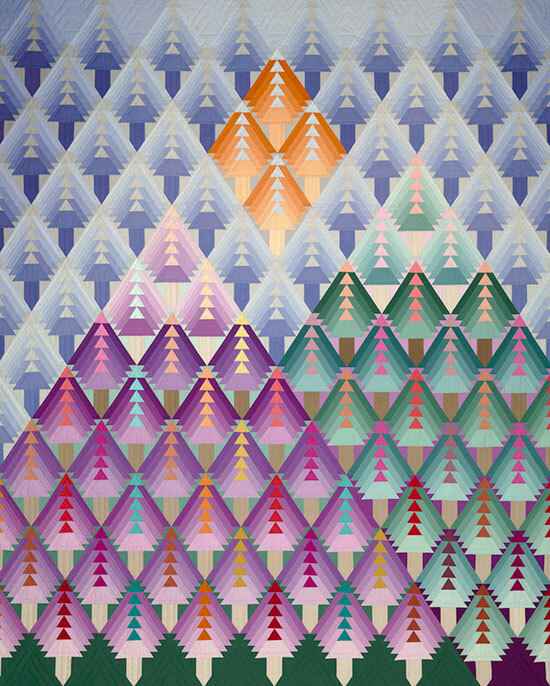 Escher—created Purple Mountains (1991), an abstractly pictorial quilt of forested mountains, sky, and sun that synthesizes her love of color and geometric design. Gayle Fraas and Duncan Slade challenge the traditional definition of quilts by blending architectural and textile elements for their Marsh Island (1986) triptych composed of painted plywood panels surrounding dye-painted and quilted cloth insets. Among the many recent additions to the BMA’s late 20th-century textile collection are five stunning quilts created by professional artists who chose to express themselves with cloth and thread, in some cases abandoning their original media in order to do so.